Indianapolis Motor Speedway officials announced the first sellout in the history of the Indianapolis 500 Mile Race today. All suites, reserved seating and infield General Admission tickets for the 100th Running of the Indy 500 presented by PennGrade Motor Oil are sold out. In conjunction with the sellout, it was announced that the long-standing practice of delaying the television broadcast in Indianapolis will be suspended for 2016. This is only the third time the race will be broadcast live on Central Indiana television and the first time since the early 1950’s. On May 6, IMS officials announced a sellout of reserved seating for the race. This included all grandstand seating, suite hospitality and several temporary suites built in turns 1 and 2. General Admission tickets continued to be available for purchase via the IMS ticketing office. Steady and increased demand for GA tickets led to today’s announcement. The Indy 500 Snake Pit presented by Coors Light is sold out as well. Tickets for Carb Day and Legends Day still remain. While the Indianapolis Motor Speedway does not release official attendance numbers, the Indy 500 is the largest single day sporting event on the planet. 100th Running celebrations have been fueled by an action-packed 100 Day Countdown that began with a midnight party on the Yard of Bricks as the clock turned to Feb. 19. Festivities have been supported by the 100th Running Host Committee, a group of community volunteers and donors that have visited all 92 counties and activated several community programs to increase anticipation for the 100th Running. Customers who already have Snake Pit tickets or IMS parking passes but have not purchased GA tickets will still be able to do so. It is heavily suggested that fans in this situation plan to purchase and pick up their tickets in person before the weekend begins. As a last resort, fans unable to do so should present their Snake Pit wristband or parking pass at the gate on Race Day, and attendants will sell GA tickets at a price of 40. Plan to arrive at IMS earlier than in previous years on Race Day. This is the best way to avoid longer traffic and entry lines. It is suggested that fans leave two hours earlier than normal and reach IMS by 8 a.m. IMS has a fantastic morning in store for Race attendees, including SportsCenter live from Pagoda Plaza, an enhanced Fan Midway and the Borg-Warner Trophy’s March to the Yard of Bricks. Learn more. 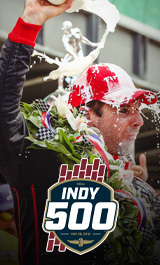 Download the IMS mobile app via the Apple and Android store for up to date maps, on site directions, schedules and more. Visit IMS.com/planyourvisit for maps, directions, alternative transportation info, gate regulations and other helpful information. Use this resource to plan your trip to the track on Race Day. Pick up your purchased tickets early! If you still have purchased tickets to pick up, make your Race Day entry to IMS smoother by visiting the facility before the weekend begins to retrieve them.